Quinoa is now a household word for people interested in The Good Taste of Health (my motto). But did you know how good it is for you? Utensils: Strainer, 1 1/2 qt. pot, cutting board and knife, mixing bowl, serving bowl or platter. 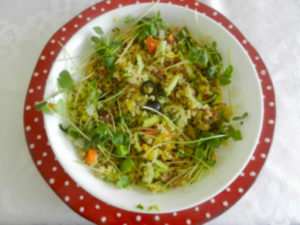 +Sprouted grains and beans are easier to digest and increase in nutrition. If sprouted quinoa is not available, regular quinoa (multi-colored looks best!) works also. Rinse dry quinoa in a strainer. Drain well. (Can also be soaked for a few minutes if you wish.) Place in water or stock in pot and cook on medium heat about 15 minutes, until all liquid is absorbed. The tiny grains will puff up. While the quinoa is cooking, dice the leek, grate the zucchini and yellow squash, grate or slice the carrot, slice the avocado, and mince the garlic. When the quinoa is cooked, cool in fridge. When cool, mix cooked quinoa with veggies. Add salt and pepper to taste. Right before serving, place salad in a bowl or on a platter, add sprouts or microgreens and serve.Yield: About 3 cups of salad. Serves 3 as a side dish. Note: Feel free to use or substitute other veggies in season, such as cherry tomatoes, chopped cucumber, scallions, etc. You may also add beans, such as chickpeas, adzuki beans, black beans, etc. For more flavor, chop some fresh dill or fresh parsley into the dish when the veggies are tossed with the quinoa. This entry was posted on Tuesday, August 1st, 2017 at 6:36 pm	and is filed under Home Page, Kitchen Nutrition. You can follow any responses to this entry through the RSS 2.0 feed. You can skip to the end and leave a response. Pinging is currently not allowed.